Visitors have accessed this post 1426 times. 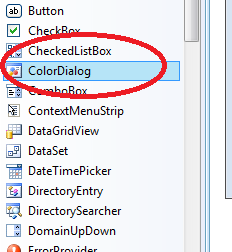 This tutorial will show you how to use a ColorDialog Box in C#. 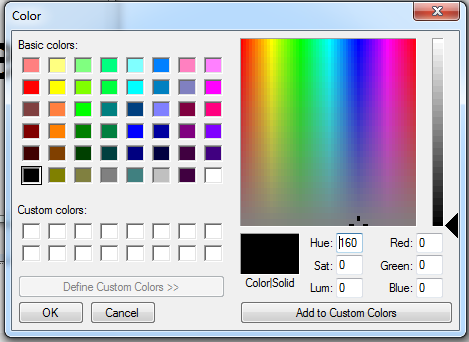 The purpose of ColorDialog box on windows applications is that, it provides a selection of colors. And you can use the ColorDialog Box for various reasons such as letting the user set or change a color of an object or specifying the background color of a windows form application. The ColorDialog Box like as show below. The figure above shows a list of colors, but if you want to have some customize or define your own color to be used. You can click the “Define Custom Colors” button. Then it will give you a design look like as shown below. 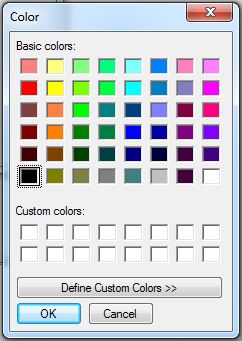 At this time, let’s create a new project in C# called “Color Dialog”. Then we will add one label and a button. This will look like as shown below. Then we will add a ColorDialog Box from the Toolbox and drag it on the form. And this will look like as shown below. In our code above, we just simply call the ColorDialog Box when the user click the button. And we set the Forecolor of the Label based on the user selected color during the run time of the application.This time, you can now test the application by pressing the “F5” or start button. And here’s all the code used in this application. joken has submitted 115 source code / articles.